Facebook estimates that more than 2.6 billion people now use Facebook, WhatsApp, Instagram, or Messenger each month, and more than 2 billion people use at least one of its “Family of services” every day on an average. The world is used to seeing Facebook posting a substantial growth every quarter but since last quarter, the social media giant has been posting a marginal increase in its revenue. Multiple controversies around data breaches and fake news put the company on a sticky wicket this year. Back in July, more than $100 billion were wiped out from Facebook's market value after the company reported Q2 2018 numbers that showed stagnation in Daily Active Users. Problems seem to have continued to hit Facebook’s revenues in the third quarter, as once again, it posted a marginal increase compared to the last quarter and narrowly missed Wall Street’s estimates. The company reported that revenue increased 33% during the thirs quarter to $13.72 billion, which is lower than the average Wall Street estimate of $13.78 billion. User growth on Facebook also seems to have stalled. FactSet and StreetAccount estimated that the Daily Active Users (DAUs) on Facebook would reach 1.51 billion mark but Facebook says that it could touch the 1.49 billion number. 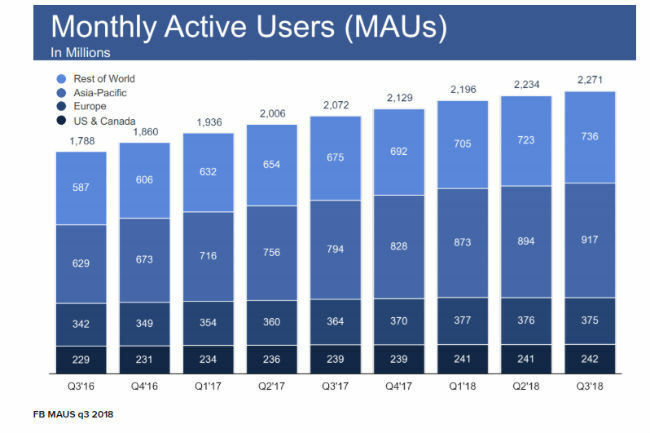 Similarly, Monthly Active Users (MAUs) were estimated to be 2.29 billion but Facebook notes that it reached the 2.27 billion mark. The company matched the average revenue per user: $6.09 versus $6.09 estimated, per 2.29 billion, according to Street Account. Citing Facebook’s earnings announcement, CNBC pointed out the revenue estimates by several analysts. Facebook said that its earnings per share (EPS) in the third quarter, which ended on September 30, was $1.76 versus $1.47 estimated by Refinitv -- a only silver lining. The total revenue was $13.73 billion which was estimated to be $13.78 billion as per Refinitiv. 1) The 1.49 billion DAUs on average for September show an increase of 9 percent year-over-year. 2) The 2.27 billion MAUs as of September 30 is an increase of 10 percent year-over-year. 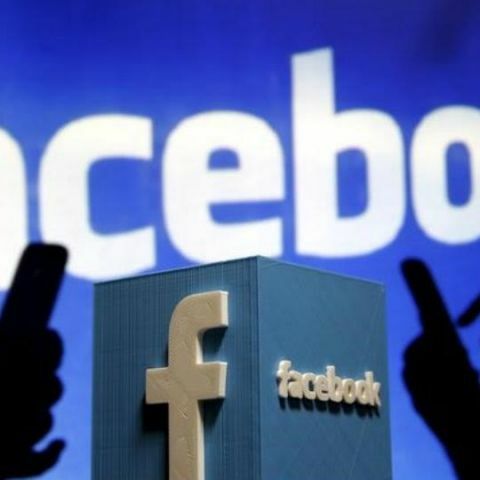 3) Facebook’s mobile advertising revenue represented approximately 92 percent of advertising revenue for the third quarter of 2018, which is up from approximately 88 percent of advertising revenue in the quarter a year ago. 4) Facebook hired a lot of people since last year, and the headcount was reported to be 33,606 as of September 30, which is an increase of 45 percent. In last quarter, the headcount was reported to be 30,275. 5) In addition, Facebook estimates that more than 2.6 billion people now use Facebook, WhatsApp, Instagram, or Messenger each month, and over 2 billion people use at least one of its “Family of services” every day on average. In the last quarter, the number was reported to be 2.5 billion.